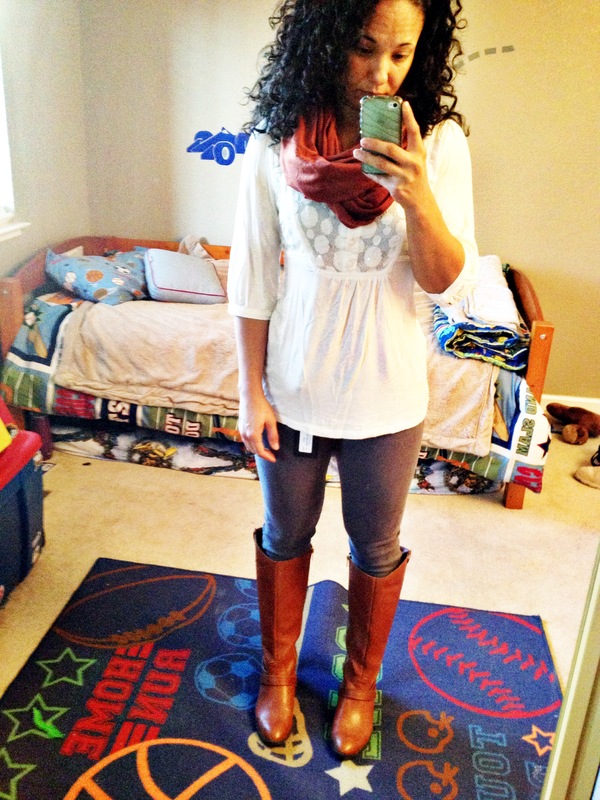 A few of my very wise and fashion savvy mommy homies have shared the wonders of Stitch Fix. Intrigued, I decided I had to try it myself. I almost always have both boys in tow which makes shopping rank up there next to pulling teeth. Having stayed home for five years, and recently re-entering the workforce a couple years ago, I have several different wardrobes in several different sizes…most of which are out of date or poorly fitting. 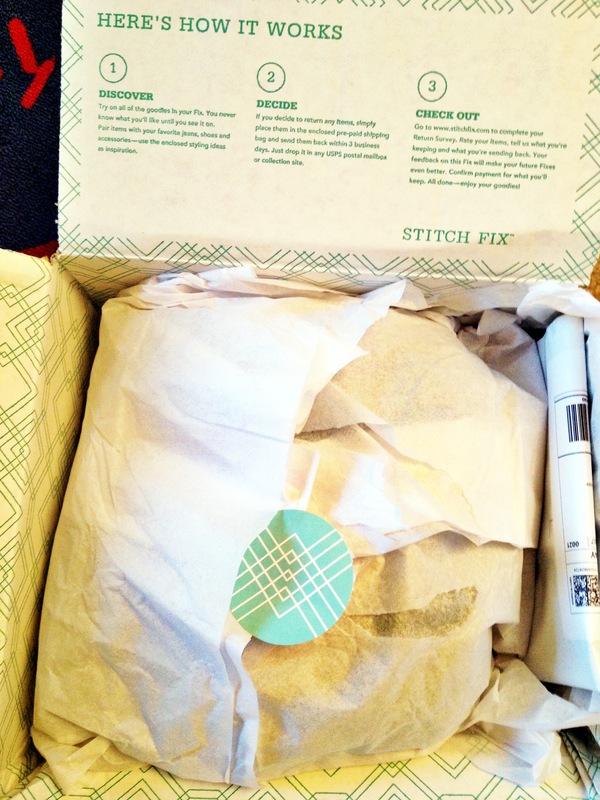 Enter the wonder that is Stitch Fix. You fill out a style profile. Set up a delivery date. And a cute little polka dot box arrives at your doorstep with handpicked clothes just for you. You can try them on at home. Without your little ones threatening to open the dressing room door or peeking their little heads underneath or hearing them YELL your size our for the entire store to hear. Mommy friendly, shopping genius for the fashion challenged like myself. 1. Just Black- Adora Skinny Jeans: I actually laughed as I pulled these out of the box. I thought for SURE there was no way I was going to fit all of me into these tiny little skinny jeans. Apprehensively, I stepped inside and pulled…and they fit. Overwhelmed with shock, I turned to the mirror and was surprised to like them. To be completely honest, I am slightly concerned that the back hem is working a little too hard and fear they may be too small. I have never worn anything so fitted. Or this shade of gray. But thanks to a quick Facebook post, my friends have convinced me to try these bad boys…KEEP. 2. Under Skies- Milan Lace Print Back Pleat Top: I loved this out of the box but wasn’t a fan of it on. It was boxy and shapeless, and made me feel schlepy. RETURN. 3. Ezra- Rothwell Chevron Strip Split Neck Blouse: I actually squealed when I saw this top. LOVED it. And then I put it on. Not so much. Disappointed. I really wanted to love this top. RETURN. 4. 41Hawthorn- Ivy Solid Tab Sleeve V-Neck Blouse: I actually really liked this one. If it had been a little less expensive, I would have kept it, but at $68 I have too many similar shirts to justify this purchase. RETURN. 5. 41 Hawthorn- Abrianna Longsleeve Cardigan: I love open, flouncy cardigans and own enough to prove it. However, this one was a little thin and a little big for my liking. LOVED the color though. RETURN. You pay an initial $20 styling fee which is then credited towards your purchase if you decide to keep any items. If you decide to keep all five items you get 25% off the entire box. 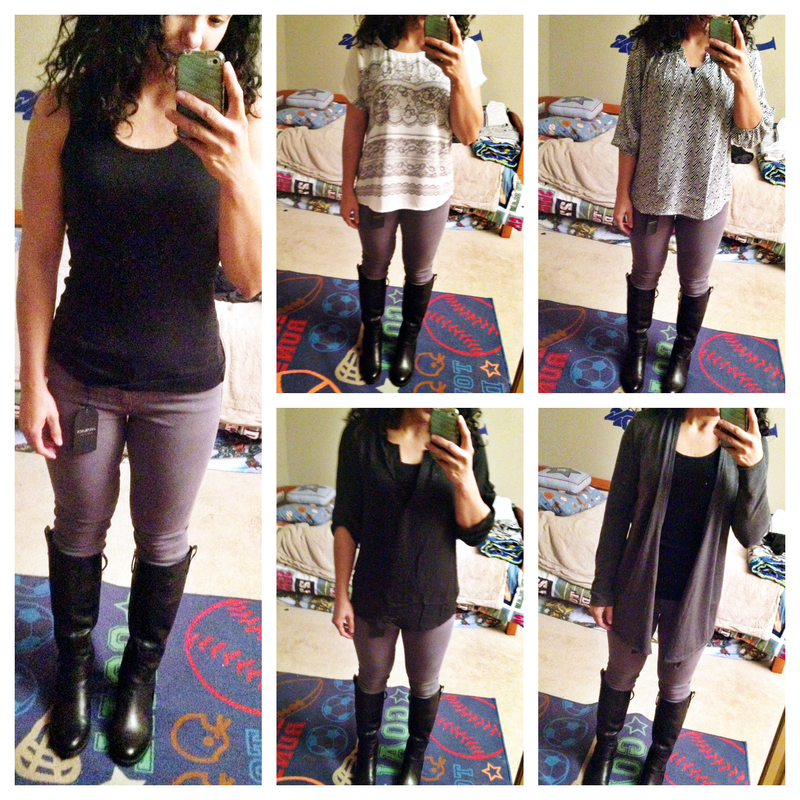 While I am only keeping one item, I am still extremely happy with Stitch Fix and look forward to my next box. You fill out an online survey following your purchase in hopes of narrowing down your style a bit more. I am hoping my next box brings more color and shape. All items that don’t work out for you are simply placed in a pre-paid priority shipping bag and dropped off at the USPS. I can do that. Even with kiddos in tow. For now, I am left with new gray jeans. A HUGE step out of my typically dark-colored bottoms. I happen to have the suggested items from the style card. Look out…heh. I shall sit and bend gingerly until I am confident those back seams can handle me. Fashion blogger, I am not. However, I am more determined to shop my closet and add new pieces to help me break my yoga pant addiction. And add more color to my wardrobe. 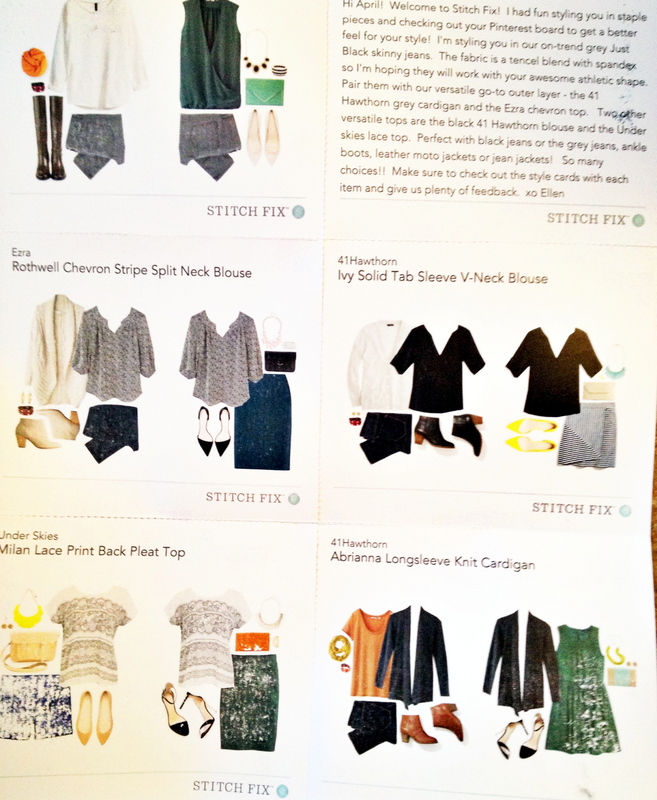 If you are interested in trying Stitch Fix you can try via this referral link: HERE. If you try it, let me know what you think and what you get!! 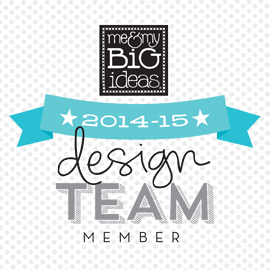 This is such a fabulous subscription service!